In my last post, I invited my readers to fill in a survey about ICT, Society and Poverty in Mauritius for a paper I had to present at a conference on Poverty and Development which took place on the 1st and 2nd October at Bell Village. I am here posting the slides I used for my presentation as well as some results of the online survey which attracted some 40 respondents (thanks to all). 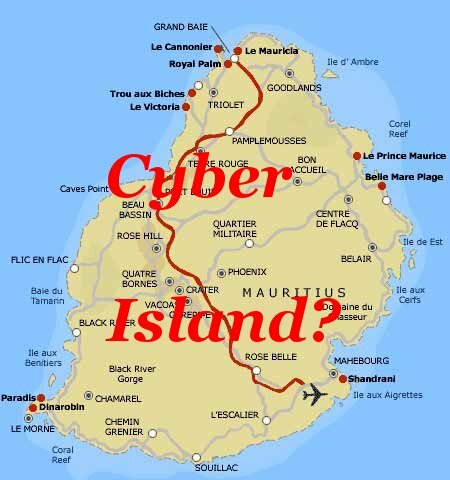 Though the results cannot be deemed to be statistically representative, they are nonetheless interesting as they provide some preliminary insights into the preceptions vis-à-vis what I call ‘The Cyber Island project’. – Most (84%) felt ICT can help Mauritius achieve social progress with some specifically referring to the potential of such technologies for reducing economic disparities and alleviating poverty by generating jobs and wealth, and others evoking the facilitation of communication and also the easier connection with knowledge centres and other nations. – 59% firmly believed such technologies can effectively help alleviate poverty (by contributing to education which helps people out of poverty, by creating employment, by increasing productivity and generating wealth which may be subject to taxes to be used for poverty reduction or even used by businesses for CSR programmes targeting poverty. – Above 60% (67%) of respondents expressed moderate to serious doubts about the ‘cyber island’ project. Most felt that the local conditions for ICT deployment and use are inadequate and insufficient to bring social progress in Mauritius. – Regarding progress achieved towards realising the project, 54% felt not much has been achieved so far. While some felt that the cyber towers are a step forward, that many youngsters are working in the ICT sector and that computers have entered most spheres of our life, others felt that this is not enough. The latter complained that many of our public services are not properly computerised, that the standards of ICT education are much lower than those of developed countries and even felt that employment in the sector is insignificant. In essence, it seems that current Internet users agree that ICT are an important feature of modern societies and, as such, the use thereof should be promoted in order to impact positively on social inclusion and development. Yet, they also feel that the grand ‘cyber island’ rhetoric is overstretched as there is a gap between the discourse and the practice. In other words, that Dissemination is too slow. I really liked that: “modern utopia or outright myopia”. I finally had some time to read your work.Nice worksheet Christina which can be used as a reference to future works on related topics. However there is something that we ‘le peuple’ we should bear in mind in the vision for a country and thats ‘La volonte politique’. If there is no real ‘political will ‘ which constantly supports a ‘country’s vision’, the gap between rich and poor will never be reduced., especially with these kinds of ‘ conseillers’ that surrounds our political leaders. These counsellors are more interested to secure their own future rather than creating a real cyber island which will enhance a positive social contribution to poor people. Whats the use of placing computers in social centres politically advertised by the MBC when in reality nobody is really using these assets and there is no even follow up of these investment.La volonte politique is mostly based on fooling people for the next election.The whole system is a corrupted system -the vision of the country is the vision of those people who bribes and finance the political parties and in return the elected parties will have go according to those who rule our economy.The vision of our country is still dictated by a group of families . It is a very Good work it did help me a lot for me school project. It was a good reference topic for me. Working on a project about futur is sometime difficult to found as we are still in the Present but your view on the topic was very usefull to me. It is and awesome and well work Article ! !